The Algarve has drawn visitors, siren-like, to its sun-drenched shores for years – its gently shelving beaches and warm air currents make for a tempting mix of ingredients. The coastline is simply beautiful – long stretches of golden sands are washed by refreshing seas and red sandstone cliffs seclude delightful bays. 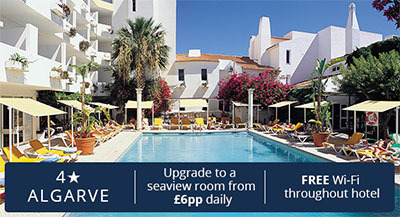 There are countless reasons to visit the Algarve – whether you’re seeking a great family getaway or a romantic escape. If there’s one standout feature that makes your holidays to the Algarve worthwhile, its the beaches – stunning sweeps of coastline begging to be explored and home to hidden coves that lend perfectly for families. Away from the beaches, there’s enough to keep you occupied in the resorts too. Albufeira offers a multitude of experiences, with charming cobbled streets making way for colourful market stalls and open-air bars perfect for lingering with a cocktail. If you’d rather embrace a little activity on your Algarve holidays, you’re in luck. Lagos boasts many beaches ideal for surfing as well as some particularly gorgeous views. Golf fans will also find the opportunity to improve their handicap on one of the Algarve’s championship golf courses. 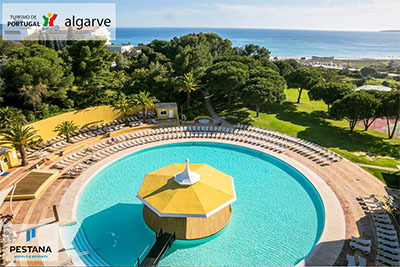 Whatever you’re searching for in a holiday, you can guarantee the Algarve will fulfil your fantasies. For a sun-kissed beach holiday, you can't go wrong with the majestic Atismar Hotel. 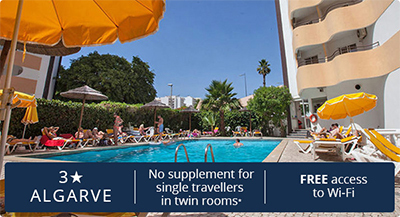 Just 50 yards from the popular sandy beach at Quarteira, and numerous other popular beaches in the area, it's easy to see why this hotel is loved by people of all ages. 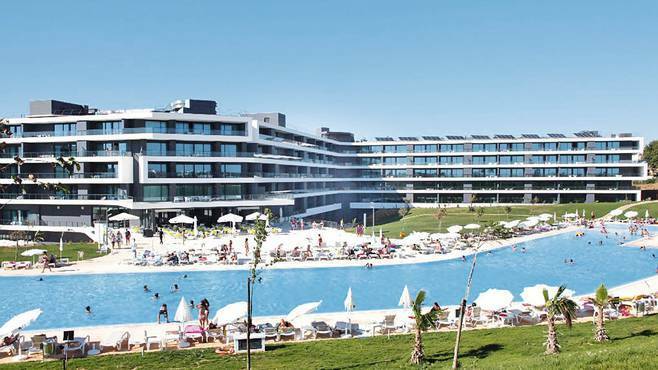 Quarteira, once a fishing village, is now a bustling tourist resort with plenty of attractions including a marina, waterpark and delightful golf courses. The colourful local markets are also a 'must see' destination on your Quarteira holiday. 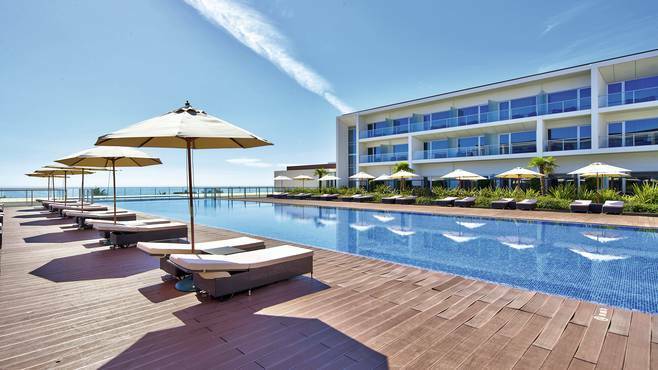 This 4-star hotel occupies a prime beachfront location in the resort of Armação de Pêra with stunning panoramic views of the ocean and is surrounded by fishing villages. It is within walking distance to a selection of shops, cafés, restaurants, and entertainment of the resort. A regular bus service operates to nearby towns and villages. 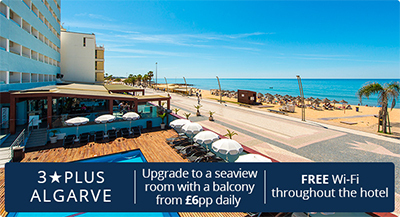 Beautifully situated, overlooking the sea at Sesmarias, the Baia Grande hotel is a wonderful example of a hotel that meets all those criteria. Set in elegant, well-tended lawns, it shows how a modern hotel can look at one with its surroundings. You'll be assured of a warm welcome and a very comfortable stay – the wide ranging amenities mean you'll want for nothing. This is another hotel that’s ideal for families. Revel in lazy days as you’ll be close to the beach, then take advantage of à la carte dining at mealtimes. While the kids make friends in the children’s club, why not have some time to yourself on the nearby golf course or with various sports classes? Regroup to make the most of All Inclusive. The Algarve might be Portugal’s most popular holiday hotspot, but it still has plenty of secrets. Sure, a record-breaking 17.4 million tourists visited last year – drawn to the sweeping beaches, cute cobbled streets, and what are probably the most modest prices for food, drink, accommodation and car hire in Western Europe. But if you think the Algarve’s all tanning, kids’ clubs and golf, think again. With around 100 miles of Atlantic coastline to explore, there’s so much more - from kayaking with flamingos to discovering dinosaur footprints. And whether you’re in a hotel, self-catering apartment or villa (where car hire is often included), it’s all within easy driving distance. Here are our favourite ways to see what we call ‘The Alt-garve’. The Algarve spans the width of Portugal, from east to west along the south coast. It’s a scenic stretch of glittering sea and rustic green hills - so no wonder some bright spark created a cycling trail that takes you all the way from one side to the other. The Ecovia starts at Vila Real de Santo António (VRSA), on the border with Spain, and ends at Cape St Vincent, the most south-westerly point on the continent. And while only serious cyclists would take on the whole route, a leisurely pedal from one little village to the next on this biking track is a lovely day out. Try the gentle, 27km segment between VRSA and Tavira in the east. Passing peaceful orange groves and fields, you’ll end at one of the region’s most traditional villages - quiet Tavira is all small cobbled squares, historic churches and blue-tile houses. While you’re in the eastern Algarve - easily accessible from Faro - check out the spooky ‘anchor graveyard’ on Barril beach. A Blue Flag-accredited sunbathing spot, you’ll find Barril on Tavira Island, accessed by miniature train. The strange sight of rows and rows of neatly plotted, giant rusting anchors commemorates the tuna fishing trade that once sustained the whole area. Even spookier is the Chapel of the Bones near Olhos D’Agua, decorated with 5,000 human skulls and bones. Eeek. Also near Tavira, natural marine park Ria Formosa, is a collection of lagoons and quiet islands that feels like your own private slice of Portugal. Untroubled by crowds, the best way to see it is from a kayak, so you can explore little waterways and find your very own stretch of sand. There’s no current, which makes for easy paddling, and the resident flamingos add a vibrant splash of colour. Loulé, about 20km from Albufeira, is known for its Saturday morning ‘Gypsy Market’ - a buzzy maze of stalls selling everything from hand-painted honey jars to decorated tablecloths. Foodies in particular will love the local produce. Gourmet treats include homemade bread, piles of cakes and authentic local piri-piri sauce (sorry, Nando’s). Seafood fans should make their way to nearby Quarteira, near Vilamoura - dive into the town’s backstreets for unassuming shacks serving up garlicky clams drizzled with olive oil, enormous crabs and fried octopus. The region’s beaches get busy come high summer. But with so many to choose from, there are a bevy of secluded beauties still flying under the radar. Praia de Salema, in the western Algarve near Sagres has secluded coves and dramatic cliffs aplenty – kids will enjoy the dinosaur footprints fossilised in limestone at the western end of the beach. The area is part of the protected Costa Vicentina Natural Park, so there’s little development here - just bobbing fishing boats, a few restaurants and gentle sea that’s perfect for swimming. Sagres is a low-key surf town right at the Algarve’s western tip. Thanks to the epic views over the seemingly endless Atlantic, when the Romans arrived here they thought they’d reached the end of the world. With no high-rise buildings, and a handful of casual cafés cooking cheap but standout seafood, it’s an unflashy sanctum popular with the bohemian set. While strong north-westerly winds here whip up world-class waves for surfing, kitesurfing and windsurfing, beginners should head to Cordoama beach, which is more sheltered and prone to gentle rollers – especially in summer. While everyone knows about Portugal’s love of port, piri-piri and seafood, not everyone knows about the Algarve’s local delicacies. Aguardente de Medronhos, or ‘fire water’, is a handcrafted, fiery brandy made from the region’s Medronho fruit - a nobbly red berry. You can visit a distillery to learn about - and, more importantly, sample - the drink, which is produced on such a small scale, you won’t find it in supermarkets. Then there’s the famous wild honey of Monchique cultivated by local beekeepers. Pick some up on your way to the viewpoint at Fóia Monchique, the Algarve’s highest mountain, just above the town. Set in a pretty nature reserve, the Robinson Club Quinta da Ria is in the eastern Algarve near Tavira, and even offers guided cycling tours. 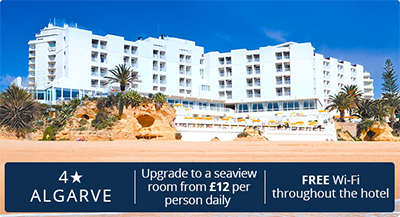 Family-friendly Alvor Baia boasts self-catering apartments, a huge pool and a free shuttle bus to the beach. 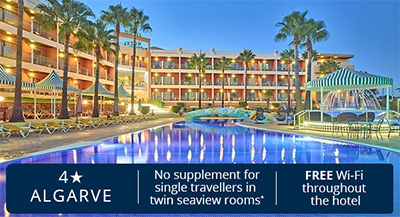 In the western Algarve, adults-only Sensimar Lagos is a romantic hideaway surrounded by sea views. The spa specialises in made-for-two massages.